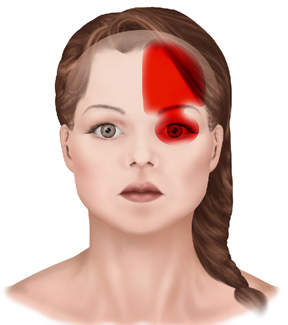 This is a typical location for a migraine. A migraine is a primary headache, which means there is no other cause of the headache such as a tumor or a stroke. The following is based on the criteria developed by the International Headache Society. If you memorize “5472 PUMA PPNV” then you know how to diagnose a migraine. Let me break down the acronym. 5472 – a history of 5 headaches lasting between 4 and 72 hours. PUMA – at least two of these four features must be met. Some people think a migraine must be one-sided but that is not the case. Photophobia (light) and phonophobia (sound) sensitivity. It must have both to meet the criteria. To clarify, nausea alone meets the criteria. If you don’t have nausea then you must have light and sound sensitivity or vomiting to meet the criteria. A study in 2003 asked migraineurs these three questions. Patients who answer positively to two out of these three symptom questions have a 93% chance of a migraine diagnosis and, if all three are answered positively, there is a 98% chance of a migraine diagnosis. Some migraineurs experience an aura. An aura can be visual such as seeing flashing lights, sensory such as tingling, or motor such as slurred speech. Here is a very unique video of a CBS reporter in Los Angeles having a motor aura, which preceded a migraine, on live TV. There are many different options when treating migraines, which I treat at my Beverly Hills office. There are abortive medications to stop an existing migraine, and there are preventative medications, which are drugs taken daily to reduce or prevent the migraines from occurring. One thing I do know is that migraines are not typically related to how your teeth meet so I would never recommend a dentist grinding your teeth to help with your migraine headaches. I would be happy to answer any questions you might about your migraine or other type of headache.